Ok, I haven’t done this sort of post for awhile, so away we go. Ask anyone who knows me in real life, and they’ll tell you that the following post is just like hanging out with old Mitch, and that it’s absolutely exhausting listening to the constant drone of me talking about Queens… That’s the Q60 rolling down Queens Blvd. 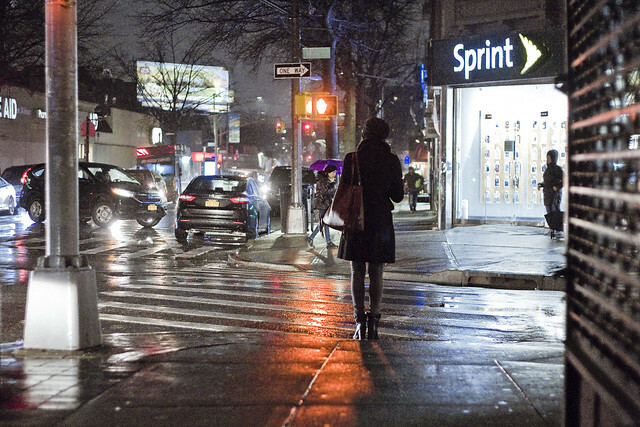 on a recent rainy night. Queens Blvd. is 7.5 miles long, starts at Queens Plaza nearby the Queensboro Bridge, and was created by merging two older roadways – Thomson Avenue and Hoffman Avenue – in the early 20th century shortly after NYC consolidation. In the 1920’s and again in the 1930’s the boulevard was widened and by the 1940’s there was serious talk of turning into it an arterial highway by – guess who… Robert Moses… but that obviously never ended up happening. The IRT Flushing Line subway stops on Queens Blvd. opened in 1917. A trolley line (owned by the Manhattan and Queens Traction Company) that used to run off the Queensboro bridge and up Queens Blvd. since 1913 was made redundant by the elevated train service, but the streetcar staggered along for a bit. It took until 1937 for that trolley to go the way of all things, whereupon a private bus company – called the Green Bus Company – recreated the trolley’s “Queens Boulevard” route in 1943 using automotive buses. MTA took over the route in 2006, renaming it as the Q60 bus line. 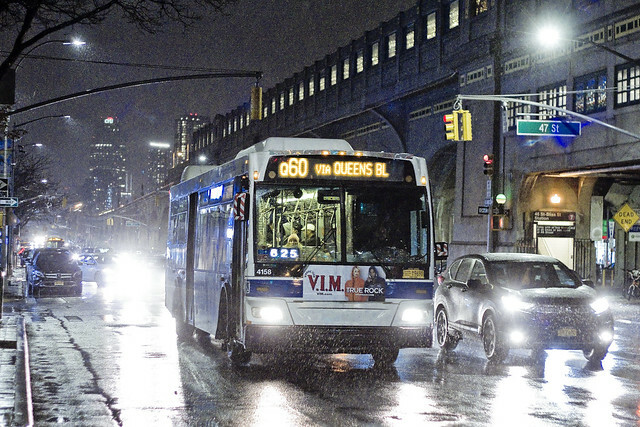 Like the old trolley and Green Bus, the Q60 service starts over in Manhattan on Second Avenue and then crosses over Queensboro into LIC, with its terminal stops occurring all the way out in Jamaica, Queens. 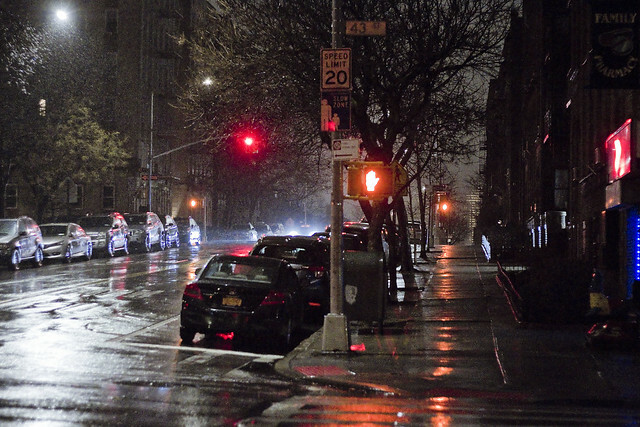 Same rainy night, but a different byway – this time it’s Greenpoint Avenue in Sunnyside. Same night, but many many hours later. I’m always shooting, even when – as in the case of the shot above – I’m wasted drunk. I had attended a friend’s birthday party and overdid it with my consumption of gin martinis. The shot above, and a couple of others which I frankly don’t remember taking, jogged my memory the next morning of how and when I ended up back at HQ in Astoria. It was still raining when I left the party in the wee hours, and still raining when I woke up. NYC receives an average precipitation of just over 45 inches of water per square acre (as in a 45″ tall flood of water which is one acre long on each of its 4 sides) – and despite my perceptions – 2018 was a fairly normal year for rain with some 46.78 inches of precipitant having been observed by those who record such matters. 2017 was a record breaker, which saw some 60.78 inches of precipitant falling on NYC. I say precipitant, as a significant amount of that water takes the form of snow. 2019 is shaping up as a record breaker as well, so far in January we’ve received a whopping 3.54 inches of rain. That’s apparently nearly 1/13th of all of last year just in the first three weeks of January, but I’m notoriously a mathematical moron, so if that arithmetic seems wrong you’re probably right. Mitch, you’re really at your best when writing about Queens history. Ironic that a great friend of Queens should hail from Canarsie, Brooklyn, an out-of-towner to us aboriginals but a good and welcomed friend all the same. An honorary “Native Queens Guy” as long as you knock off calling us “Queensicans” [sic]. An interesting thing to note regarding M&QT was that when I was going through old local newspapers for letters to the editor about trolleys (getting the general public’s view on the subject) I found the the riding public really liked M&QT. It was well run and managed and the riding public was disappointed to see it go. Contrast that with NY&QT which was badly run and the riders were delighted to see it replaced by buses. In regards to the 7 train, IRT did not want to build it to “go out to the corn fields” but did so as a concession for the 7th ave line, if I recall correctly from one of Vincent Seyfried’s books I can’t locate at the moment so forgive me if I got it wrong. But anyway, the IRT Flushing line was not intentionally built to compete with M&QT’s Queens Blvd line unlike almost all of the IND lines were. per say but from the the town from which we hail (me being a Coronian) and therefore I amend my statement of Mitch being an honorary “Native Queens Guy” to Honorary “Native Astoria Guy”. ^Cav is absolutely correct. I’m in Elm, I was born in Elm, first and foremost. Grew up in W’msburg (not Bklyn). The boroughs are only mentioned when absolutely necessary. The borders ‘tween the towns are still clear to me as any fence line or mountain range. Here ends Maspeth, there starts Middle Village.